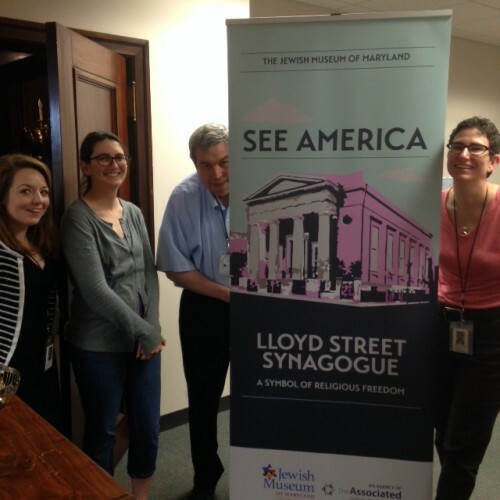 Marvin sometimes describes the Lloyd Street Synagogue as the Museum’s single most important “artifact.” It is the reason the Museum exists, since saving the building was the impetus for the founding of the Jewish Historical Society, the precursor to JMM. It is the reason we have a Lloyd Street address. It is one of the oldest physical anchors of the Jewish community in Maryland. The Lloyd Street Synagogue before its exterior facelift to its present, historically accurate shade of pink! About a year ago now, my colleagues and I decided that we wanted our members, visitors and friends to better appreciate our architectural gem. We appointed a champion for the synagogue, a staff member advocate tasked with encouraging the rest of us to think about ways to incorporate the building into our day-to-day operations and conversations. In the fall, we decided to give the old girl a little bit of a makeover, investing in new carpeting for the aisle, deep cleaning for the pew cushions, and a fresh coat of paint on the bima. In February, with all of this as a backdrop, I had a lightbulb moment. I was in New York City, walking the floor of the Jacob Javitz convention center for the annual wholesale gift show, when I came to the booth of a vendor who specializes in creating merchandise for Museum Stores. Among their offerings that day, they had reproductions of the National Park Service’s iconic travel posters of the 1930s and 40s. 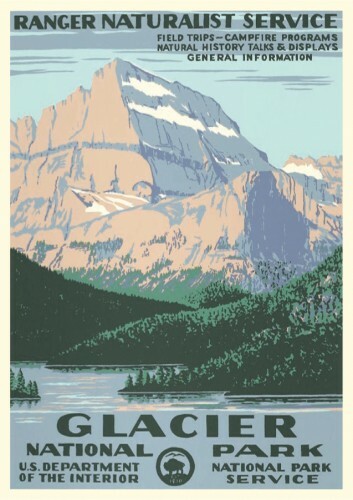 I smiled as I flipped through the images, thinking of my own poster of Glacier National Park, purchased on a visit to Montana in the 1990s. 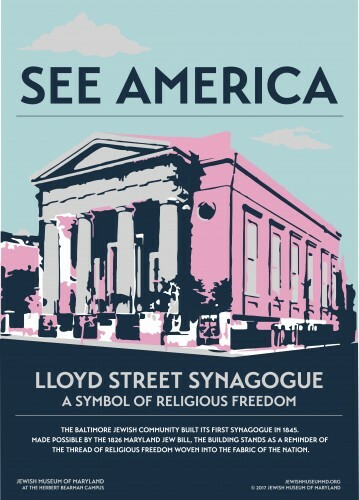 And then the lightbulb: what if I developed a poster of the Lloyd Street Synagogue in the style of those old silkscreens? The wheels were turning overtime. I envisioned the pinks and blues of the graphic image, and some accompanying language that would express the importance of the building as a symbol of religious freedom in Maryland and in America. Back in Baltimore, Joanna helped me scour the collections for the right photographs to use as models, and then I reached out to the vendor I’d met to get their help developing the art. They would be happy to help me develop the artwork, for a small fee. I hesitated. Who would own the intellectual property rights? How much would it cost? Was it worth it? I picked up the phone. I called Esha Jannsens-Sannon, Creative Director at the Associated. She does (or oversees) the graphic design on all of the marketing work that comes out of the JMM. I explained my idea to her and asked if it was something she thought she could do and whether she’d want to. The first version of our design. For the next several weeks and into months, she and I iterated this idea through version after version. My JMM colleagues watched the growing pile of versions with amusement at my wild ideas. At some point I had a second lightbulb, and realized that the headline should mimic some of the Park Service’s posters, and invite the viewer to “See America,” after all, part of the point that I wanted to make about the LSS is its historical significance. 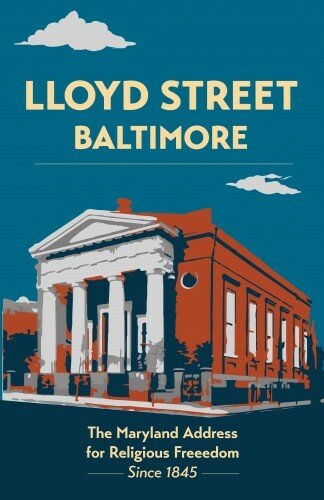 The Baltimore Jewish community built its first synagogue in 1845. 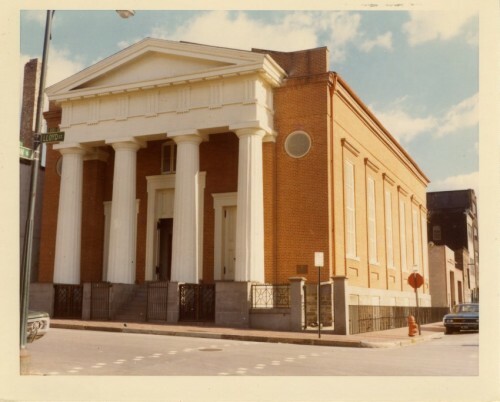 Made possible by the 1826 Maryland Jew Bill, the building stands as a reminder that the thread of religious freedom is woven into the fabric of the city, the state, and the United States. Esha patiently pulled the whole thing together through each of my new ideas and tweaks, at one point adjusting color and text placement as I stood behind her at the computer. As Esha and I discussed how large I should have the poster printed, Esha said “you know what I would love to see? Let’s do a silkscreen.” I was instantly sold. The posters we’d modeled were silkscreens. It’s an old and a beautiful printing process, and so appropriate for our image, and so we started seeking a partner to print it. A happy staff with our beautiful new banner! Once we had a final draft that we were both happy with, my colleagues were no longer tolerating my wild ideas. They were excited about what we’d created. Really excited. As a team, we decided that the image was a powerful one, and one we wanted to promote. We had a banner made based upon the imager for use at the JCC block party and other community events. We used the image on the cover of our program for the Annual Meeting, and we’ll be using it on the cover of our forthcoming Annual Report. Ready to be the first on your block to own this meaningful and beautiful poster? After a slightly disappointing false start, the 18” x 24” silkscreen posters will be available at Esther’s Place the week of June 19! I LOVE the poster! Great job! Thanks so much Esther! We also now have mugs, magnets, cards, and even tote bags with this fabulous image available in the shop!